RB Alex Collins vs. LB Joe Schobert – Collins has been on fire recently, finishing in the top-three highest graded running backs three of the past four weeks. In that span, he has forced a total of 19 missed tackles, the third-most of any player, and he is averaging 3.30 yards after contact per carry. Schobert has been solid against the run this season, as evidenced by his run-defense grade of 80.0 (tied for 24th among 90 linebackers). Schobert has the most run stops of any linebacker this season with 37 but may have difficulty containing the red-hot Collins. WR Mike Wallace vs. CB Jason McCourty – Wallace has a tough matchup this week against McCourty, whose overall grade of 83.9 ranks 22nd of 118 cornerbacks. He has been proven to be beatable this season, however, as he has allowed five touchdowns in coverage, tied for sixth-most among all cornerbacks. Wallace has hauled in at least one deep target (passes of 20-plus yards in the air) in two straight games and has caught 43.8 percent (seven) of his 16 deep targets on the season. T Ronnie Stanley vs. Edge Myles Garrett – Stanley has been up-and-down this year in pass protection, allowing at least three pressures in five games and allowing one or zero pressures in four other games. Garrett has accumulated at least three pressures in seven of his eight career games, but he hasn’t had a sack either of the past two games. He has never gone more than two games without recording a sack, so this matchup should definitely be an exciting one to watch. 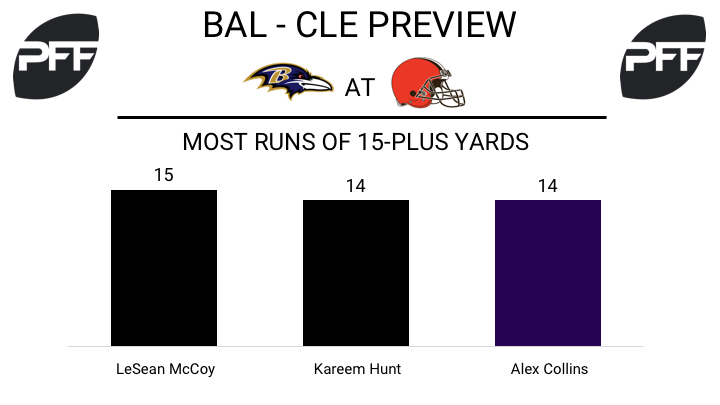 WR Josh Gordon vs. CB Brandon Carr — The Ravens have not shadowed an opposing wideout all season long, opting instead to play their cornerbacks to set sides of the field. Unless that changes this week, that means the Browns will be able to dictate matchups with Gordon, with Carr and his 51.0 coverage grade (ranked 88th of 118 qualifiers) being the most likely player to target. In the two games with Gordon back in the lineup, DeShone Kizer has a 93.7 passer rating when targeting Gordon and a 43.6 passer rating when targeting any other wide receiver. Browns tackles vs. 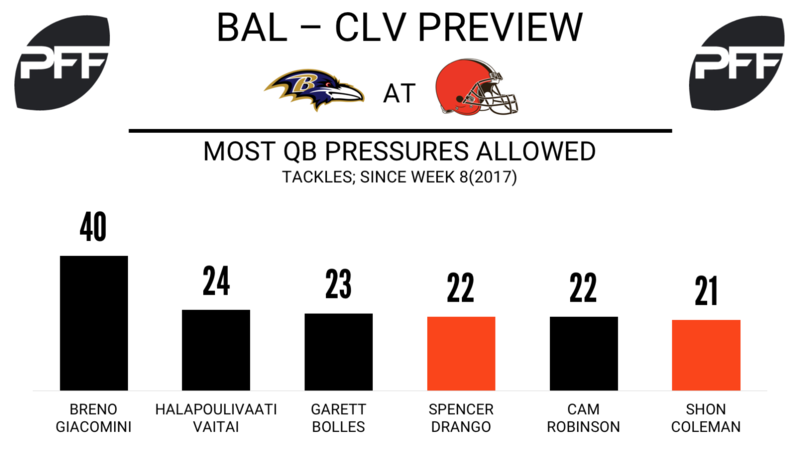 Edge Terrell Suggs — Without the presence of Joe Thomas at left tackle, the Browns have struggled to get even average play out of their tackles, particularly in pass protection. Since Week 8, the first full week without Thomas, Spencer Drango and Shon Coleman have combined to allow 43 quarterback pressures across 461 pass-block snaps, with both players ranking among the bottom-six tackles of 54 qualifiers in pass-blocking efficiency. Both players will see Suggs across from them at points on Sunday. QB DeShone Kizer when kept clean — For much of the season, Kizer has struggled even when he hasn’t had to deal with pressure. During the first 11 weeks of the season, Kizer’s 68.9 passer rating when kept clean ranked dead last. However, over the past three games, that number has taken a significant turn in the positive direction, as his 104.8 passer rating when kept clean ranks 13th over that span. That improvement will be tested against one of the NFL’s best pass defenses this week. When they’ve been unable to generate pressure, Baltimore has allowed an opposing passer rating of 82.3. Only the Jaguars and Saints have been better.